The 5301 and 5328 Bicone Bead has been the all-time most popular bead Swarovski has ever made and continues to be so. The 6328 Top-Drilled Crystal Bead takes that same style, flips it around and instead of the hole running through the center, it runs through the top, adding new ways to utilize this fashionable shape. You can use this Swarovski component as a pendant or it has been very popular to stack many of them together creating a clustered look that people refer to as Rock Candy Jewelry for bracelets, necklaces or rings. However you like to get creative, the Top-Drilled Bicones are versatile to design with and stylish to wear. The 5301 and 5328 Bicone Bead has been the all-time most popular bead Swarovski has ever made and continues to be so. The 6328 Top-Drilled Crystal Bead takes that same style, flips it around and instead of the hole running through the center, it runs through the top, adding new ways to utilize this fashionable shape. 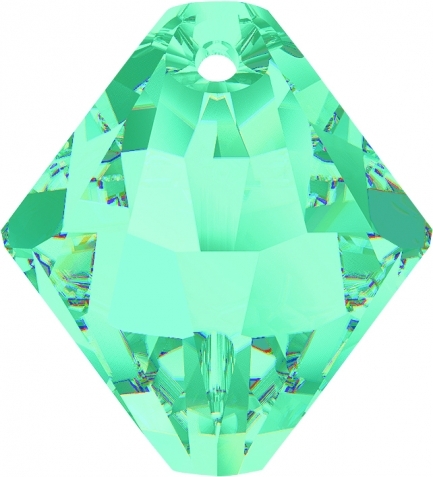 You can use this Swarovski component as a pendant or it has been very popular to stack many of them together creating a clustered look that people refer to as Rock Candy Jewelry for bracelets, necklaces or rings. However you like to get creative, the Top-Drilled Bicones are versatile to design with and stylish to wear.